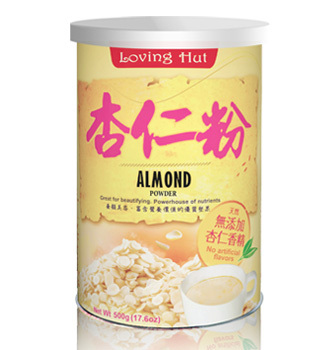 ◎Loving Hut Pure Almond Powder uses selected Almond as its main ingredient. After the steamed and shelling process, the almonds are dried and baked under low temperature and grounded into powder. It is fragrant and deliciously tasty. Almond is known for its nourishing properties and is great for complexion and health if consumed regularly. It can be drunk on its own or mixed with soy drink or other cereal powdered beverages. Whichever way it is prepare, the product will retain its delicate fragrance. In the plant kingdom, Almond is the seed from a species of tree of the genus Prunus, classified under subfamily Prunoideae of the family Rosaceae. Because almond is grown naturally in the wild, we have included this product into our Organic Family series. This product requires no cooking – just add hot boiling water and adjust the thickness to your liking. 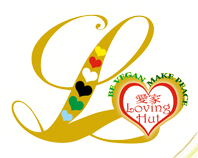 It can also be mixed with soy drink and other Loving Hut cereal powdered beverages. ■ ISO9001、HACCP、ISO22000 High Quality Certification. Ingredients : Sweet Almond, Yam powder, Naturally Grown Oats Powder, Isomalto-oligosaccharide, Lotus Root Powder. Storage : Store in a cool and dry place. Keep airtight after opening.